..... The vertical fin is a symmetrical sandwich composite structure with solid foam core. two layers of UNI at 45 degrees to the trailing dege of the vertical fin for torsional stiffness and surface durability, and spanwise tapes of UNI for bending strength. The skills that you learn in this chapter will come in handy on the more complicated structures like the main wing and canard. ..... Construction begins by jigging the vertical fin core on the jigging table. Locate the vertical fin core that you previously hot-wired. along with the vertical fin trailing edge core. .....Find the vertical fin female jigging templates(2). .....Measure 10.0" down the trailing edge from the tip of the vertical fin (the small chord end) and make a mark. 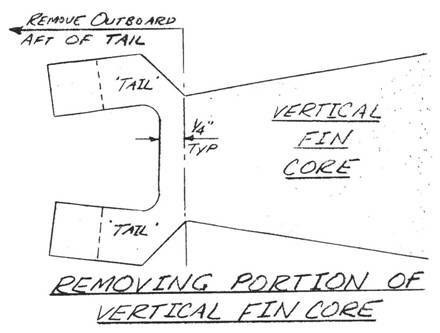 Remove the portion of the vertical fin core shown. This is done because the rudder extends only partway up the vertical fin. Trial fit the vertical fin trailing edge core against the vertical fin core where the surgery had been performed. Note that the vertical fin trailing edge core was hot-wired longer than necessary, and will have to be trimmed to fit properly. When the cores are dry fit together, they should make a smooth transition. If not, any depressions must be filled with micro prior to glassing, and any bumps and joggles can be sanded away. Join the vertical fin core- to the vertical fin trail ing edge core with micro slurry and a few dabs of 5-MIN to hold the two together. 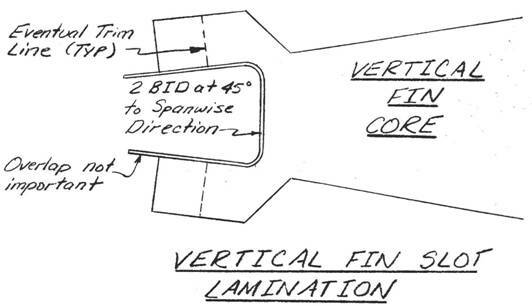 Since the vertical fin is symmetrical, verify upon assembly that the vertical fin trailing edge core is not attached cocked to one side. .....Next, glass the vertical fin slot with 2 BID at 45 degrees to the spanwise direction. This will be easier if you support the vertical fin core vertically temporarily. ..... Now, study the sketches and jig the vertical fin core to the vertical fin female jigging templates with the 'tail' of the vertical fin trailing edge core pointing down toward the jigging table. Make sure that all level lines are level. Sand the Itail' of the vertical fin core so that when you laminate the skin, you will obtain a glass-to-glass bond at the vertical fin slot. .....The lamination of the skin and spar caps is very similar to what you have previously accomplished in making the ailerons, elevators, and rudder. It would perhaps be wise to review that chapter at this time.